Doh! After a hard landing ever experience the annoying "escaped fin? " The flight was otherwise good but the fin stuck in the mud & peeled away from the body. Someone was very helpful in suggesting I reattach the fin "Wildman" style. 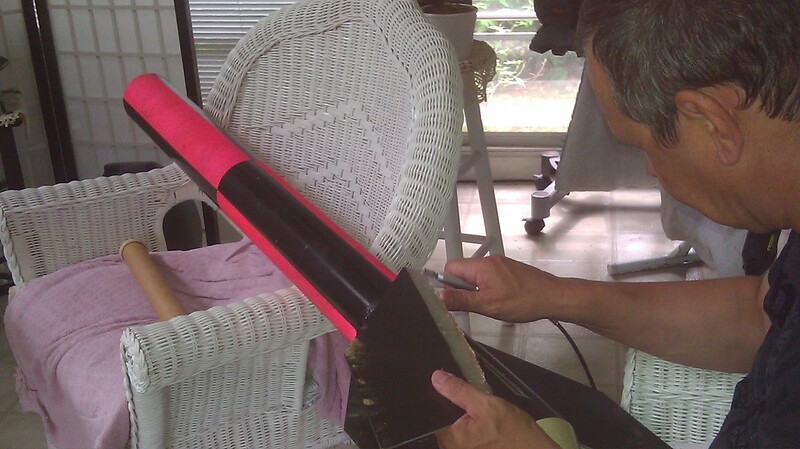 Ok...drilling the holes & injecting the epoxy is easy, so how do I re-insert the fin? The old epoxy was still stuck to the fin & body & this prevented the fin from being re-inserted into the slot. I quickly realized that I had to remove as much of the old epoxy as I could from the fin & body before I attempted to re-attach the fin. I started to hand sand & root it out with an Exacto knife but I quickly realized it woiuld take the rest of the summer. What to do to speed up the process? My wife noticed the pain I was going thru & she volunteered her power nail file which is actually a modified Dremil tool. I outfitted the bit with a medium grit file & in about an hour I had all the epoxy removed from the fin & body. I started at the base of the fin where it attaches to the motor mount, then I moved to the epoxy where it attaches to the body & lastly I removed the fillets & paint from the body to ensure a good expoy bond. I then drilled 6 holes to inject the epoxy to finish off the repair "Wildman" style. How good was the repair? Another hard landing tore off a different fin so it's back to the repair shop. Make sure you check out the motor mount for any damage prior to repairing the fin. If the fin causes enough damage to the mount then the integrity of the whole area will be comprised & the rocket should gbe retired. You can examine the motor mount with a flashligh thru the slot. In this case the 54mm mount had some slight damage where the fin tore away. 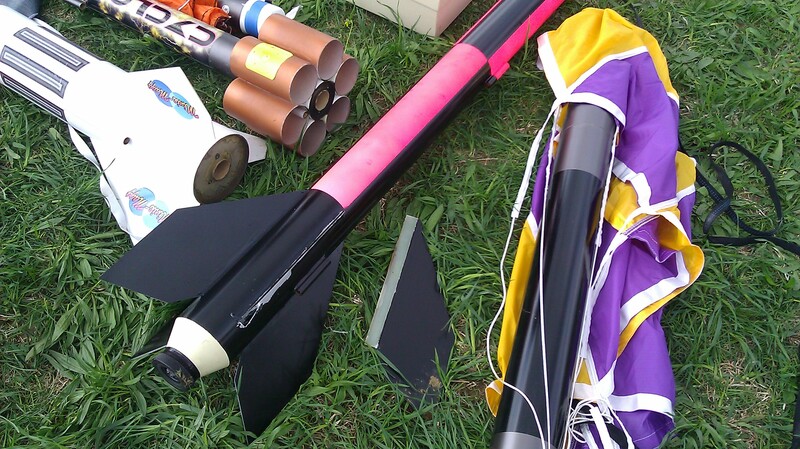 When the fin was re-attached the epoxy flowed around the damaged area so it's good to fly again. I also fly this on a 38mm motor so even if the 54mm mount has some damage the 38mm adapter has more than enough integrity to have many more flights.